When the New Horizons probe flew past 2014 MU69 on January 1, 2019, it became the farthest object in the Solar System ever to be visited by a spacecraft. 2014 MU69, nicknamed Ultima Thule, is a Kuiper belt object (KBO): a chunk of rock and ices orbiting the Sun beyond Neptune, left over from the formation of our solar system. In the days and weeks since the fly-by, data from the encounter has streamed back to Earth, refining our theories of how planets form and suggesting intriguing new avenues of research. And none of it might ever have happened, if not for the work of NRC-Herzberg ARC members JJ Kavelaars and Stephen Gwyn. New Horizons was originally launched in 2006 with the primary mission of visiting Pluto. The secondary objective was to go on and visit one or more KBOs after the Pluto encounter, but at the time of launch, no particular target had been chosen. The orbits of the KBOs just weren’t known with enough precision to be able to predict which objects would be in range when the time came. The search for a second target began in earnest in 2011. Because New Horizons carried only enough fuel for small course corrections, the target KBO would have to be in a narrow cone extending from Pluto. The object also couldn’t be too distant, or there wouldn’t be enough power to take the observations and beam them back to Earth. Astronomers spent dozens of nights searching with the world’s major observatories, including the Canada–France–Hawaii Telescope (CFHT) in Hawaii. Citizen scientists were called in to help through the Ice Hunters project. But by 2014, no suitable targets had been found, and time was running out to make the necessary course corrections. Many astronomers felt the solution lay in the Hubble Space Telescope (HST): its space-based location would allow it to detect objects the ground-based telescopes could not. But HST is one of the most sought-after scientific instruments in the world. To be granted time, the New Horizons team would need to show they had a solid plan of exactly where and how hard to look. Dr. Kavelaars provided that plan. From 2003 – 2011, Dr. Kavelaars had led the Canada France Ecliptic Plane Survey, which used CFHT to create the first detailed map of the structure of the outer solar system. Using this map, Dr. Kavelaars and his co-investigators determined which patch of sky was most likely to contain a suitable object. This target information was then combined with a detailed analysis of the distribution of sizes of objects in the outer solar system completed by UVic alumnus Dr. Wes Fraser, to accurately predict how faint such an object was likely to be. Armed with this information, the New Horizons team was granted time on HST in June 2014, and by October, Ultima Thule had been found. But a simple detection was not enough; scientists needed to know the object’s precise orbit, so New Horizons could be redirected to the right part of the sky. 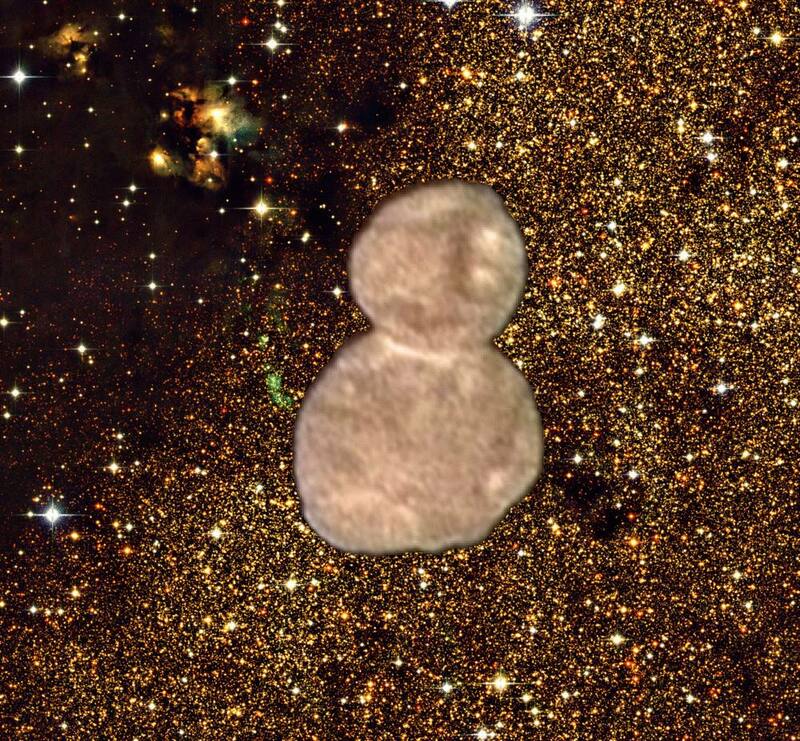 The HST images showed very accurately where Ultima Thule was relative to the stars behind it. However, it’s notoriously difficult to determine exactly where HST is pointing in the sky. The science of determining the exact location of astronomical objects is known as astrometry, and Dr. Gwyn is an expert in the field. To solve this problem, he used images from CFHT of the same patch of sky. CFHT wasn’t able to see Ultima Thule, but it could see the stars behind it, and Dr. Gwyn was able to very accurately determine the location of these stars. These stellar positions were used to calibrate the HST images, and so determine an accurate orbit for Ultima Thule. Based on Dr. Gwyn’s work, New Horizon’s engines were fired briefly after its 2015 encounter with Pluto, and just over three years later the probe arrived at Ultima Thule. Drs. Gwyn and Kavelaars were at the mission control centre at Johns Hopkins Applied Physics Laboratory for the event. The Washington Post described the evening as “the solar system’s nerdiest New Year’s party”: NASA TV broadcast live coverage of the talks and tributes; New Horizons science team collaborator (and Queen lead guitarist) Brian May released his latest single; and scientists, engineers, and friends and family enjoyed champagne and snacks as they counted down to the new year – and 33 minutes later, to the fly-by itself.